On January 30, 2018, we celebrate National Croissant Day in honor of that great “French” pastry roll prevalent among breakfast bars in hotels across the country. Flaky, buttery, soft and delicious, Croissants are great as they are, with butter and/or jelly, or as the basis for a light sandwich, including breakfast sandwiches (as Burger King so deftly demonstrates). For all the terrible things people say about bread and its supposedly negative impact on health, the fact is bread keeps people alive and has done so for centuries. Today we list 10 of our favorite types of bread and invite you to nominate your personal favorites. This bread is my all time flat out favorite bread of all time. Try it, and it just might be your favorite, too. Made by the Abbey of the Genesee in New York, a Trappist monastery, the special bread they make there was originally intended only for the monks and their guests, but word spread and demand grew, and now the bread is available commercially, mainly in the Rochester, New York area. The bread is made some familiar varieties, such as white, wheat and raisin, and the monks make some related products such as jams and fruitcake. The white bread, when toasted, is a slice of heaven… They even have an online store at: https://monksbread.com/. I have to admit, my wife and my mother make the very best Banana Nut bread I have ever had, but I also admit I have had many other samples that were also delicious. 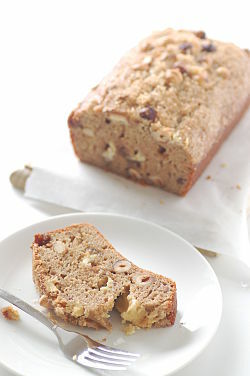 If you do not like nuts or are allergic, say goodbye to the chopped walnuts and just have plain old Banana bread. Just be sure to include enough oil in the recipe and fresh bananas so that the result is a nice heavy and moist end product. Bob Evans restaurants usually serve Banana bread and their product is pretty good. Of course, this bread is a dessert type bread that is good for a snack, for breakfast, for before a meal, or accompanying a meal, but not so much for sandwiches! A little softer than French bread, Italian is often a little crunchy on the outside, but not always. It is a versatile loaf that can be used for just about all purposes, from toast and sandwiches, to dipping or with a main course. 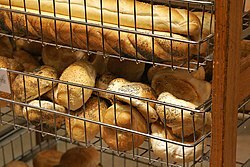 Italian bread is often found in the form of sandwich rolls and hoagie rolls, or as breadsticks. It is great for sopping up excess pasta sauce. Mangia! 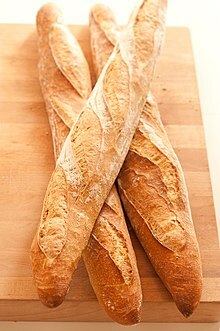 Who is not familiar with the spectacle of a Frenchman on a bicycle pedaling down the road with 5 foot loaves of French baguettes sticking out of a paper bag? These long torpedo looking loaves make great dinner companions and do not have to be warm to be good. We prefer them with butter, but not everyone does. They go with soup, salad, and main courses equally well. Crusty on the outside, chewy on the inside, just get them while they are fresh. Made from flour, water, and salt, this ancient form of bread pre-dated the use of leavening (yeast) that causes other breads to rise and have all those familiar little air holes in them. In fact, some flatbreads can be slightly leavened to fluff them up just a tad. This stuff can be pretty thin, such as a tortilla, or be “pocket bread” like a pita, or be somewhat thicker like the flatbread Subway uses. It is great for making a sandwich or wrap, or for rolling up and used to sop up gravy or soup. For a treat, try rolling it up and dipping it into olive oil with dipping spices. Regional and national varieties have all sorts of additional spices or ingredients to make the local flatbread unique. No, these are not a hybrid between Basset Hounds and Beagles, but an unleavened circle of heaven with a hole in the center. Known largely as a Jewish staple, bagels have spread to all corners of the USA, and instead of Lox (salmon) they are more often eaten with butter and cream cheese. (Cream cheese now comes in many flavors, largely because of the popularity of bagels.) Of course, jelly or other good stuff can be spread between the halves, or they can be eaten plain. They make a pretty good outer shell for sandwiches and can be found in breakfast sandwiches in your grocery store or at McDonald’s. Bagel dough makes a great coating for “bagel dogs” (similar to pretzel dogs) or filled with a variety of fillings ready to pop in your microwave. Not really as versatile as most of the other breads listed, this specialty loaf is pretty much for making a delicious mouth watering toasted treat. You can consider cinnamon rolls in this same category, and the prevalence of Cinnabon stands all over the nation are a clue as to how delectable those darn things are! We do not mean “real” Rye bread, which is also known as “blackbread” or “Pumpernickel,” but the kind you find in delis in the US, which is actually a combination bread of wheat flour and rye flour, giving the characteristic light brown color. Great for sandwiches or for making toast, this bread is virtually essential for making a Reuben or the best sort of Ham sandwich. Personally, we think Rye bread is the best bread for peanut butter sandwiches as well. Said to be introduced to France by Marie Antoinette when she married the future King Louis XVI, Marie brought the pastry from her native Austria where the crescent shape (“croissant” means “crescent” in French) to the French court where it caught on in a big way. The Austrian name for the roll is “kipferls.” As stated above, this is a versatile roll great by itself or with other foods. Ashton, John. The History of Bread. JPU, 2016. The featured image in this article, a photograph by Raysonho @ Open Grid Scheduler / Grid Engine of a pile of croissants, is made available under the Creative Commons CC0 1.0 Universal Public Domain Dedication. The person who associated a work with this deed has dedicated the work to the public domain by waiving all of his or her rights to the work worldwide under copyright law, including all related and neighboring rights, to the extent allowed by law. You can copy, modify, distribute and perform the work, even for commercial purposes, all without asking permission.